Home > Blog > New Addition to the Men’s Mission! New Addition to the Men’s Mission! If you visit the Men’s Mission, you’ll notice a new addition in the parking lot. 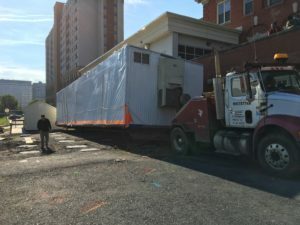 In place of the old Donation Center trailer is a new double-wide trailer that will be used to house the Donation Center and additional seating for meals served at the Men’s Mission. We were in desperate need of more seating as the current cafeteria only seats 48 people at a time. Since we can serve up to 150 people at one meal, we currently eat those meals in 3 shifts to accommodate shelter guests, staff, and the public soupline. Though the hope is to build a permanent expansion onto the kitchen and cafeteria area, we don’t have the funds to do that at this time. The addition of the trailer is meant to be a temporary solution for the next 3-5 years. Once this temporary solution was identified, we looked into buying a trailer but determined it would be too great of a cost. We then set to work finding someone who would be willing to donate a double-wide trailer to the Mission. Fortunately, Steelton-Highspire School District had one that they graciously gave us. The trailer was delivered on Wednesday, October 31. It will require some repairs, so we don’t have a projected date for when it will be ready for use. But once it is up and running, half of the trailer will hold seating for approximately 100 people for use during all three meals each day and half will hold the Donation Center. 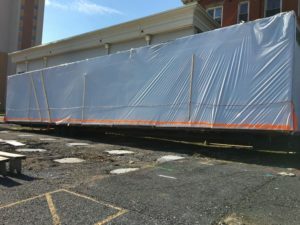 The plan is to build a covered walkway from the current cafeteria to the trailer. We are very thankful for this new addition, which will allow us to feed guests, staff, and the public all at one time, making it easier for our cooks to coordinate making meals and our house supervisors who will no longer have to coordinate 3 shifts of people at each meal.